Perfect for all the Spring holidays…St. 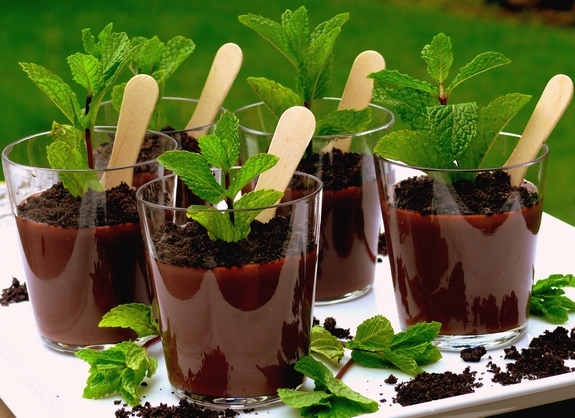 Patrick’s Day, Eater or April Fool’s Day, these Potted Chocolate Mint Pudding desserts will be the hit of the party. These mini mint puddings sprout to life with their mint seedling growing out the top and ground-cookie dirt sprinkled on the surface. What a great way to celebrate Spring with these cleverly disguised desserts. Pour pudding into votive candleholders and serve with wooden “plant marker” spoons. Perfect for April Fool’s Day! The kids will love these but so will adults. You can easily use your favorite recipe, adding mint extract at the end or try this one, it’s delicious! Whisk together sugar, cornstarch, cocoa and 1/8 teaspoon salt in a medium saucepan. Combine cream, milk and vanilla in a liquid measuring cup. Pour 1 cup cream mixture into sugar mixture and whisk until cornstarch is dissolved. Add remaining cream mixture and whisk until smooth. Bring to a boil, whisking constantly, and cook until thick, about 5 minutes. Reduce heat to low and add chocolate. Whisk until chocolate melts, about 1 minute. Remove from heat. Add mint extract and butter, and whisk until butter melts. Quickly divide pudding, whisking as you work to prevent sides from setting up, among eight (4 ounce) glass votive candle holders, leaving 1/2" of space at the top. Refrigerate until set. Just before serving, pulse cookies in a food processor until finely ground. Top each with 1 Tablespoon ground-cookie "dirt," and garnish with a planted mint sprig. Serve chilled. How adorable! Your photo is stunning, Cathy! Those mini glasses are so cute…would you share where you purchased them? Thanks so much! These are adorable, creative and a great way to usher in the gardening season. Could also be done with other herbs like an orange basil with chocolate. Wish you were able to give the carbs as I’m trying to cut back on them. These will have to be one of our “Rites of Spring”! How fun, I love these. I’m making some mint chocolate sandwich cookies from MS right now. These are so cute! Love the chocolate and mint combo! What a cute and clever idea! My two grandchildren will love this. Forget the kids, I LOVE these! Where do you get the chocolate wafer cookies? None of the groceries around me have them–I used oreo crumbs instead. I just wanted to say how much I enjoy your website, and just really have a lot of admiration for all the hard work you put into your life’s dream and your family. Thanks for sharing with us! The weather here in SF is finally warming up, and it feels like spring for the first time this year. These would be a great dessert to serve at the season’s first cookout. This is amazing! Just found your amazing blog and am a new follower! DECADENT? Yes! Definitely looking forward to trying out this recipe. Love the spring-look they have to them. 🙂 Thanks for posting! These are adorable What a fabulous idea for a garden party.